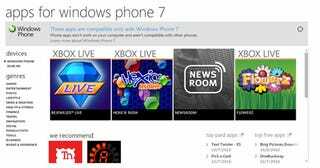 How Many Windows Phone 7 Apps Will Be There at Launch? Microsoft really, really doesn't want to talk about numbers when it comes to apps. No one say how many will be available at launch. All I got one Microsoftie to admit is, "It'll be more than iPad at launch." "It'll be more than iPad at launch. More than the iPhone." The iPad had around 350, if that says anything. "What matters isn't how many apps we have, it's that you can find the apps you need." That's Microsoft's story, and they're sticking to it.